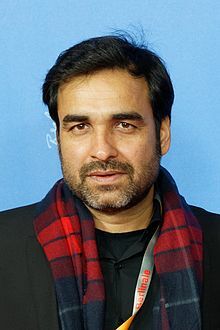 Pankaj Tripathi is an Indian actor who appears predominantly in Hindi films. Famous for his natural acting, he debuted in 2004 with a minor role in Run and Omkara and has since worked in more than 40 films and 60 television shows. Tripathi's breakthrough came in 2012 for his supporting role in the Gangs of Wasseypur film series. He has since received critical appraisal for multiple films, including Fukrey (2013), Masaan (2015), Nil Battey Sannata (2016), Bareilly Ki Barfi (2017), Newton (2017), Fukrey Returns (2017) and Stree (2018). For Newton, Tripathi earned several awards including a National Film Award – Special Mention. Tripathi was born in Belsand, a town in Gopalganj district, in the Indian State of Bihar, to Pandit Banaras Tripathi and Hemwanti Devi, as the youngest of their five children. His father works as a farmer and priest. Tripathi also worked as a farmer until he was in the 11th standard at school. During festive seasons, he used to play the role of a girl in his village's natak which according to him was appreciated by the villagers and ultimately prompted him to make a career out of acting. He moved to Patna after high school where he did theatre and was active in college politics as a member of Akhil Bharatiya Vidyarthi Parishad. Out of fear of failure in acting he also worked briefly for a hotel. After his stay of about seven years in Patna, he moved to Delhi to enroll in the National School of Drama, from where he graduated in 2004. After graduating from the National School of Drama, Tripathi came to Mumbai in 2004 and did an uncredited role in the film Run. However it was eight years later in 2012 that he made his breakthrough, when he was widely praised for his role in Gangs of Wasseypur. His audition for film went on for about eight hours. In 2008, he acted in the Bahubali TV series, and later in Powder on Sony TV which is now currently available on Netflix. In his early career, he played mostly negative roles and became synonymous with gangster characters. Later he played various roles and won critical appraisal for the same. His first film as a lead actor was the 2017 film Gurgaon. His 2017 film Newton was India's official entry for the Academy Award in best foreign film category. Tripathi made his debut in Tamil cinema with the film Kaala which released on 7 June 2018. In the Indian remake of Criminal Justice(2008), Tripathi plays a small-time lawyer. His is loosely based on the character played by Con O’Neill in the BBC original and by John Torturro in the American adaptation The Night of(2016), which starred Ben Wishaw and Riz Ahmed as the murder accused in the British and American versions respectively. It is out streaming on Hotstar from 5 April 2019. Tripathi married Mridula on 15 January 2004 and they have a daughter. Yours Truly Vijay World premiere at the 23rd BIFF in October 2018. ^ "कभी गेट पर रोक देते थे गार्ड, आज इस एक्टर की फिल्म पहुंची ऑस्कर". Dainik Bhaskar (in Hindi). 26 September 2017. Retrieved 29 September 2017. ^ Jamkhandikar, Shilpa (20 September 2017). "Q&A: Pankaj Tripathi on surviving in frog-in-the-well Bollywood". Reuters. Retrieved 29 September 2017. ^ a b "Story of Pankaj Tripathi: From jail cell, hotel kitchen to big screen". The Times of India. ^ Guftagoo with Pankaj Tripathi. Rajya Sabha TV. 5 April 2016. ^ a b "Oscar में इस बिहारी एक्टर की मूवी, अभी भी मिट्टी के चूल्हे पर बनता है खाना". dainikbhaskar (in Hindi). 22 September 2017. Retrieved 29 September 2017. ^ Danish Raza (5 August 2017). "Pankaj Tripathi, the scene-stealer of 'Gurgaon'". Hindustan Times. Retrieved 29 September 2017. ^ Ramnath, Nandini (20 April 2016). "The Pankaj Tripathi interview: 'The audience should be in the same room as the character'". Scroll.in. Retrieved 30 September 2017. ^ Joshi, Namrata (19 September 2017). "Acting is like a journey into unexplored terrain, says Pankaj Tripathi". The Hindu. Retrieved 29 September 2017. ^ "Kaala Karikaalan actor Pankaj Tripathi: Gurgaon is a very special film for me". The Indian Express. 8 July 2017. Retrieved 1 October 2017. ^ Kaushal, Ruchi (28 January 2017). "'Nil Battey Sannata' is my story: Pankaj Tripathi – Times of India". The Times of India. Retrieved 29 September 2017. ^ "Don't like people appreciating my negative roles: Pankaj Tripathi". The Indian Express. 30 April 2016. Retrieved 1 October 2017. ^ Rishabh Suri (20 September 2017). "Bareilly Ki Barfi actor Pankaj Tripathi: Cinema is not just a medium of entertainment". Hindustan Times. Retrieved 1 October 2017. ^ "'Newton' is India's official entry to Oscars 2018". The Hindu. 22 September 2017. Retrieved 30 September 2017. ^ "Rajini is my idol, working with him has been so enriching: Pankaj Tripathi on 'Kaala'". The News Minute. 22 September 2017. Retrieved 1 October 2017. ^ "Busan Film Festival official site". ^ "The man of the moment, @TripathiiPankaj, will inspire everyone with his role of #ManSingh. #CastOf83". Reliance Entertainment Twitter. 7 February 2019. Retrieved 18 February 2019. ^ Bhowal, Tiasa (12 September 2018). "Panga: Richa Chadha And Pankaj Tripathi Join The Cast Of Kangana Ranaut's Film". NDTV. Retrieved 7 March 2019. ^ "Pankaj Tripathi joins the cast of Irrfan Khan's Angrezi Medium". Indian Express. 13 April 2019. Retrieved 14 April 2019. ^ Rao, Soumya (1 April 2019). "'No one's seen me in such a role': Pankaj Tripathi on playing a lawyer in 'Criminal Justice'". Scroll.in. ^ Desk, The Hindu Net (13 April 2018). "Sridevi wins posthumous National Award for 'Mom': Here is the full list of awardees". The Hindu. Retrieved 16 April 2018. ^ "Pankaj Tripathi Gets A Special Mention For His Performance In Newton At 65Th National Awards". Deccan Chronicle. 14 April 2018. Retrieved 16 April 2018. ^ "VIDEO: News18 REEL Movie Awards I Pankaj Tripathi Wins Best Supporting Actor for Newton". News18. Retrieved 16 April 2018.